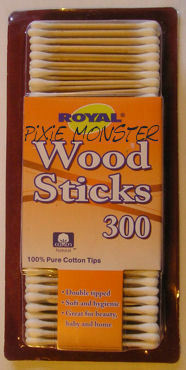 Royal Wood Stick Cotton Swabs This auction is for brand new packages of Royal wooden stick cotton swabs. Each package is brand new, never opened or used. 300 ct swabs with 100% pure cotton tips. Hard to find wooden sticks! I will combine shipping please ask! If you buy more than one of this product please request a total, so I can adjust shipping costs. From a smoke free home. If you have any questions or concerns please feel free to email me!